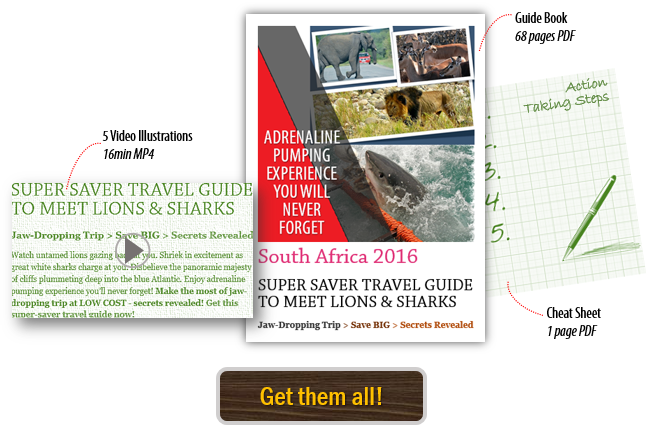 « Read the thrill of ‘shark cage diving’..
« Read our ‘awesome’ Day 1 & 2 in Cape Town..
Thrill never ends in Cape Town – so we thought as our motor boat circled the rocky barren Duiker Island off Hout Bay, home to thousands of Cape fur seals. Many lay idle while others slipped in and out of water, groaning and snorting all the time. For them it was breeding time we were told, but the rough waters posed threats to the young pups getting washed away into the hungry bellies of the large predators. 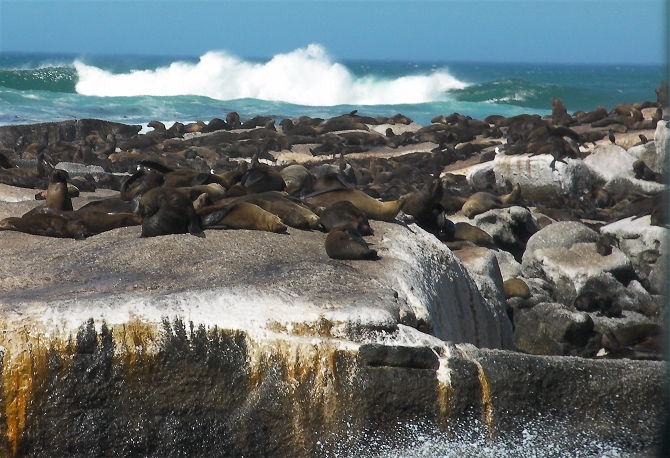 The Duiker Island trip was a 40-minute cruise from the Hout Bay, and it was our first stop in today’s itinerary. The elderly guide who fetched us from our doorstep into the super-luxury bus was already proving to be an excellent companion for the day. She kept on reminding that the bus had a toilet in the back so we could make use of it when needed. There were 17 of us traveling in this trip, and our guide was mindful that we shouldn’t lose our way at the places where we stopped. About an hour into today’s trip and we were already hooked on to the excitement that lay ahead. Cape Town is a picturesque city, and lively. But how popular is the city after all? Take a look at the following chart that tells you an inspiring story. As we drove to the Cape of Good Hope it was increasingly evident that there would be a big rush of tourists at the destination. But thanks to excellent maneuvering by our guide and driver, we steered away from the rush, and yet comfortably spent time at both Cape Point and Cape of Good Hope a few kilometers apart. Though the sun was right on top, the view of the Atlantic was simply awesome. 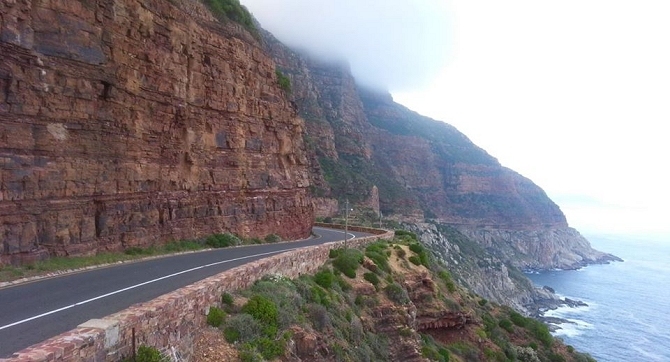 That however paled before the heavenly view we witnessed when later we passed along the 9km winding route, called the Chapman’s Peak Drive, to Noordhoek. 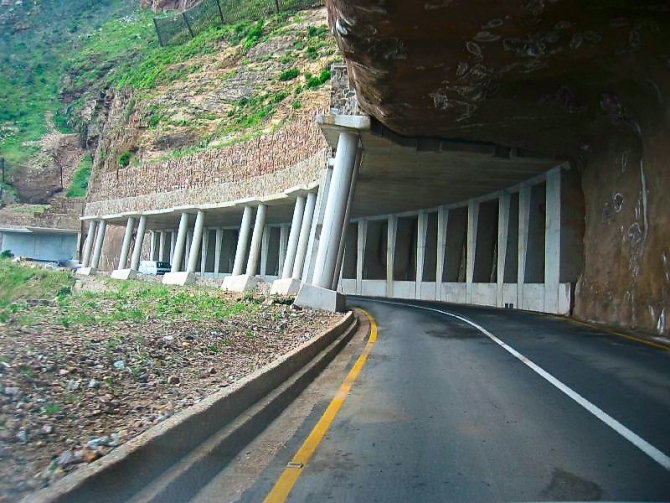 It was widely regarded as one of the most scenic stretches of road anywhere in the world. At places the peak loomed overhead as we drove through side-open tunnels on the cliffs that plummeted deep into the sapphire blue ocean. The awe-inspiring panorama was so infectious that for once we forgot to take photographs. But I won’t disappoint you, so here are some images below. 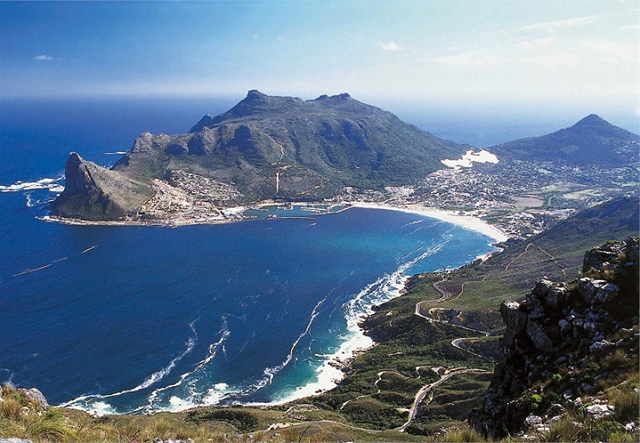 Sentinel above Hout Bay – image courtesy The Colosseum..
Our third day’s trip also took us to the Jackass African penguin colony at Boulder’s Beach before the Chapman’s Peak Drive, and later to the Kirstenbosch Botanical Garden. Like all the places we’d been to on this day, both Kirstenbosch and the penguin colony was worth visiting for their uniqueness, and we felt having time well spent. We couldn’t forget the thrill of previous day’s shark cage diving. At the back of my mind the thought swirled constantly that we’ve been to the place that witnesses havoc during the annual Sardine Run in July every year. That’s when the predators from air and sea alike feast on millions of sardines that migrate to the warm waters in the Indian Ocean along the southeastern coast. Just watch the NatGeo Wild video below to get a feel of what happens!! We wanted to let our mood sink in. So no program was fixed for the day except visiting the museum opposite, and if will permitted, the Castle of Good Hope, which was 15 minutes’ walk from our apartment. Eventually, we strolled around a bit, marveled at the floral beauty at the centuries old Adderly Street Flower Market, negotiated – or shall I say, haggled – for cheaper prices for t-shirts at the Grand Parade opposite the historic City Hall where Nelson Mandela gave the first freedom speech, and whiled away the time at the vibrant and colorful Waterfront. All along this extended time we chatted, filled in each other with inputs, and exchanged notes about our trip. Finally, it was evening, and the time to pack up and leave. We said bye to each other, and to the wonderful city of Cape Town. Looking back at our 12-day trip to South Africa I now realize that it has been the best of all the trips I’ve made abroad so far. We had arranged our city trips to be picked up and dropped off to our apartment. This eliminated the anxiety and the conveyance cost for making those trips from elsewhere, more so as we were new to the city. We selected the most important places to see, and left out a few. This uncluttered our travel plans, and that in turn gave us time to enjoy and relive every moment of our stay. The final day before leaving had to be free from engagement. We didn’t want to return home feeling tired. Having meticulously planned the trip we did not face unexpected expenses, and were never pressed for overspending. Again, coming to costs, we broke our expenses into 4 installments. 3 of these we paid prior to leaving for the trip, and the fourth one about a month after coming back. To give actual figures, we paid Rs.35,000, Rs,20,000, and Rs.25,000 in September, October, and November before the trip. And we made the final payment of Rs.17,000 in end-January after the trip. This alone was a big, big relief since we phased out payments, and there was no ‘pressure’ as you’d expect with tour companies. How we did this is something I’ve revealed in my book below. If you are as determined as we were to save costly dollars or rupees from your spending budget, yet enjoy the most exciting South Africa trip ever, just get hold of my uber-cheap travel guide package below, and get going! Bon voyage!